If you’ve ever wondered what you can do to get started with meditation so that you set yourself up for success from the get-go, then this will help. When I first began meditating over 20 years ago I was fortunate enough to find a beginners meditation class that was being held not too far from where I lived. Over a 6 week period I got to get a feel for what meditation was about and it actually set me up to make it a daily habit. 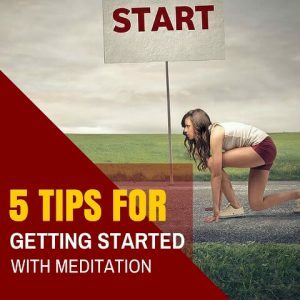 Here are my top 5 tips for anyone who is interested in starting up a meditation practice. I started off doing 1 hour meditations once a week and the only reason that worked for me is because it was with a group of people and there were question and answer sessions along with sharing time. I don’t recommend this for everyone. If you’re starting on your own then aim for 5 to 10 minutes a day as that seems to be doable for most people. Scientific studies have shown that it’s more beneficial to spend a bit of time each day to meditate, than it is to do it at irregular intervals. Anytime we start a new habit it helps if we make it super easy for ourselves to make it a part of our daily routine. If that means giving yourself an extra 5 or 10 minutes in the morning to fit it into your schedule, then set your alarm clock accordingly. Regardless of what time you decide to meditate, make it the same time every day and then stick to it for at least 30 days so it becomes a new habit. The best way to learn to meditate is to approach it with an attitude of joy. If you have fun with it and don’t take it too seriously, then you’ll be setting yourself up to get the most out of your meditation time. That means do your best to have no expectations around what ‘should’ happen during or after your meditation. Treat each time you meditate as if it’s your first and then let go of any preconceived ideas you may have borrowed from books other teachers as your own experience will be your guide. Don’t be afraid to try out different types of meditations and meditation teachers. There’s no one-size-fits-all in meditation, there’s only what works for you. The biggest mistake I see people make when they first start to meditate is that they try a meditation that’s not right for them and they give-up before they even get started. I usually give any new meditation technique I start at least 7 days to see it how it goes. After that, If I still like it, then I add it to my list of meditations that I can use on a daily basis. One of the secrets to meditation having a wider impact on both our mental and physical health is that it helps us to become less judgmental about our mind, emotions, and even our physical sensations. As this happens, then a greater sense of acceptance for ourselves and others starts to arise. It’s not that we have to do anything in particular to be more accepting, it’s that as we learn to accept our thoughts and feelings, instead of trying to avoid or get rid of them, then compassion arises naturally in our heart. Meditation is one of the biggest gifts you can give to yourself if you are looking for something that can allow you to have more calm, clarity and peace of mind. I know that by starting out my day with a 20 or 30 minute meditation, it is easier to stay relaxed to deal with whatever the day brings. I firmly believe that anyone can learn to meditate and that all that’s required is the willingness to give it a try and the humbleness to not try and control it. As time goes by and your meditations get easier and take you deeper inside yourself, a whole new world of happiness and fulfillment is yours for the taking.